White Cloud Mountain minnow can be reared in ornamental fish bowls. This ornamental fish is known in the aquarium trade in various names like White Cloud minnow, Chinese danio and White Cloud Mountain fish. These species of minnows are native to China and are first discovered in White Cloud Mountains. 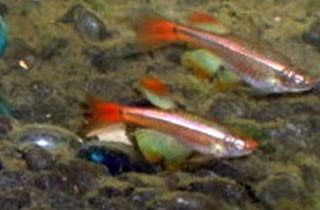 These mountain minnow are very hardy and tolerate fluctuations of temperature, pH and water hardness. They can stand low temperatures and usually do not require heaters. There are two main variants of this pet namely 'meteor' and 'white cloud golden'. 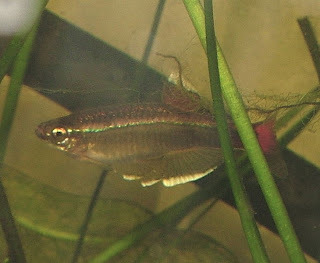 Other variants like blond, pink and golden meteor have resulted due to breeding techniques. These breed easily scattering their eggs among the plants and substrates in the ornamental bowl. The breeders may be given worms for good results. The eggs hatch after two days and the babies are fed with feed powder and infusoria. The babies can be kept with the parents in fish bowl if the space permits. However the increased demand for oxygen must be taken care of. If the bowl is quite large up to 5 numbers can be kept in it. These are quite hardy pets. These are omnivores and they can consume formulated feed like flakes and pellets. These can be fed twice daily taking care that they are not overfed and no residual food is left behind in the ornamental bowl.